Every year I seem to make my way back to my hometown for a short period around the Christmas holiday. That only makes sense that I would. One stop that I have to make every year is the giant Santa statue on Lincolnway. It has been around since I was a kid, and that was a long time ago. The statue has seen better days in spots, but for how old it must be it looks really good. Who knows how many more Christmas holidays that I will spend in LaPorte. 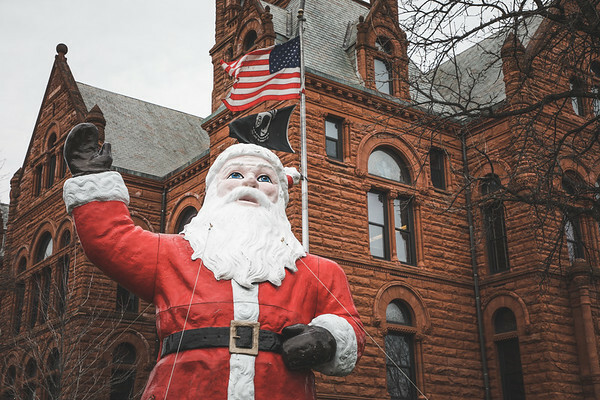 I wanted to photograph some of the little things that make Christmas in LaPorte so cool. It is how I first learned about the holiday after all. Last year we were pretty certain that it would be the last that we would spend at our childhood house. Through a bunch of fallen through deals my parents are still in the house. That will all end at the end of January. This last trip home was spent going through all of my stuff that I have conveniently stored there for many years. It is time to move on from most of it, but it was also really cool to see some things that I have not seen for a long time. Some of that stuff will inform some future blog posts.